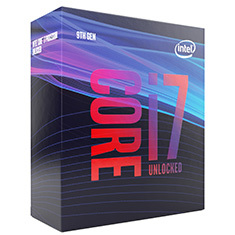 *Limit 1 per household* Intel Core i7 9700K 3.6GHz (4.9GHz Turbo) 8 Core, 8 Thread Unlocked Desktop Processor, LGA1151, 12MB SmartCache, 95W TDP, Intel UHD Graphics 630, BX80684I79700K. Does not include fan, heatsink or thermal paste. Please note: a BIOS update may be required for compatibility with 8th generation 1151 motherboards; consult your motherboard manufacturer's CPU compatibility list to confirm.